EU Trade Commissioner Cecilia Malmstrom’s visit to London to promote the EU-US Transatlantic Trade and Investment Partnership (TTIP) has been met with protest, as MPs say more transparency is needed to address public concern. Malmstrom’s meeting with business and political leaders Monday afternoon was an attempt to shore up more public support for the deal, which has been criticized for allowing large corporations to flourish at the expense of small businesses. Business Secretary Vince Cable will tell the Commissioner there are many benefits for the US and the EU, but only if politicians are given access to TTIP as the treaty develops, so that they can ask questions on behalf of the public. Protest group StopTTIP UK, however, say Monday’s meeting ignores the fact “people across the EU are loudly and clearly rejecting” TTIP, claiming the trade deal could jeopardize governments’ legal freedom and will lower trade standards. They also say small businesses will suffer the most, if TTIP is passed. “Large scale industrial agriculture will out-compete small scale producers,” they add. 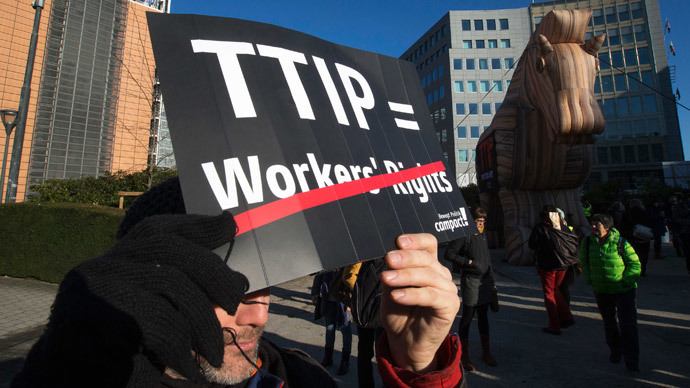 Critics say TTIP will compromise European governments’ autonomy and leave them at the mercy of multinational corporations. The investor protection dispute settlement (ISDS) mechanism in the trade deal will allow companies to sue governments, the fear of which, critics argue, will prevent the process of developing protective regulation. There are fears, too, that while Malmstrom says the standard of trade regulations will not be lowered, the harmonization of trade regulations means lower standards are inevitable. StopTTIP say this will put the UK’s “health, safety and environment” at risk. “In coming to London, Ms Malmstrom is visiting the very core of the TTIP push. Behind the gold chains of the City of London, the transnational financial services industry is at the heart of promoting TTIP and the rest of the EU’s ‘trade’ agenda. European citizens have spoken but who will she be listening to while she is here?” asks Linda Kaucher of StopTTIP UK. Cable believes strong opposition to the trade deal could be pacified if MPs are given the same access as members of the European Parliament (MEPs) to view TTIP negotiating materials. Cable said he opposed the levels of secrecy surrounding the deal. “I dislike the level of secrecy that has surrounded the transatlantic trade deal so far and can completely understand why some people are worried. I have met many campaign groups over the last nine months to discuss this and taken on board many of their concerns. I will be working to ensure all British interests are protected and that the deal can be properly scrutinized,” Cable said.